This one totals over 600 paths and took around five days of work to finish, but I'm quite proud of how it turned out. Both of those were taken from rather grainy sources (respectively a low-res framegrab and rather noisy JPEG scan), but I thought they deserved a bit better treatment- hence the vector tracing. Anyone else messed with vector images before or now motivated to do so after seeing these results (or, I suppose, any requests )? Those are amazing, Tari, very impressive work. No particular requests from me, but anything that you're planning of working on in the near future? Very nice images! You are taking requests, right? 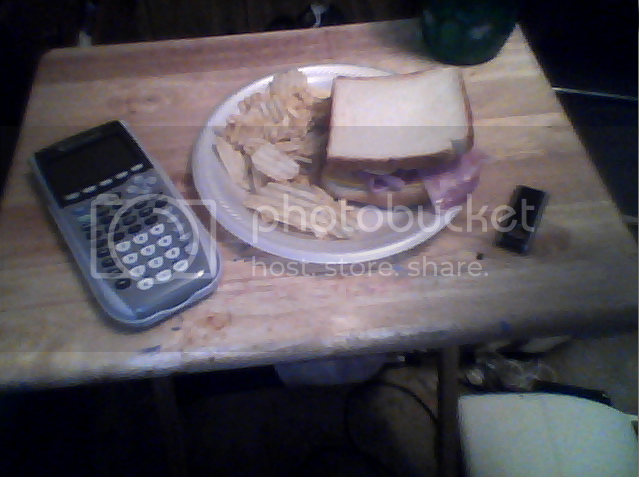 In that case, can you make my food, calculator, and flash drive look awesome? They were taken with my webcam in low light, so they look sloppy. Edit: I know it's not the vector "style" but it would be cool to see it in that way, if at all possible. Double Edit: If you can't or don't want to, how about my Luigi avatar? That would be easy. Hmm, that might be pretty interesting if that were to be in vector style. 20 minutes or so. Not very good (IMHO) since the original lacks much detail at all. As for the other image, it's not difficult to get something passable out of Inkscape's automated vectorizer, which is powered by potrace, but I don't care enough to do it myself. That's fine, and the Luigi looks pretty good considering you had only 80x80 pixels to work with. Thanks! The one in everyday use came from a vectorized rendition of the original sprite. Wow, that has to be like a 3000% increase in size. ..and that's what happens when someone who knows the subject well gets at it. Me, I'm just someone throwing that together. So basically you vectorized a sprite that was already vectorized and then scaled down. SWEET! Sprite->Vector->Scaled->Vector. Considering all the cycles to lose detail and the quick work, Tari, I'd say you did quite a good job. You know who was really into vectors during his membership at United-TI? This guy. Whoa, our very own Joe Penna is Youtube's #8 most highly-subscribed? That's awesome! I had previously seen the second one in IRC, and it seems quite good, but I really like the first one. Indeed, I find that one more interesting as well. The latter needs some sort of fancy background, I think. Ooooh, an excellent point! I think that that would probably do the trick. And the one I did before that. Pointless amounts of detail on the shoulders and left eye, but it looks good. Epic oh so epic. I love how that raster background rounds out that first image in particular, and sweet video. Thanks for including that glimpse of your creative process. © Copyright 2000-2019 Cemetech & Christopher Mitchell :: Page Execution Time: 0.137251 seconds.